The one genetically distinctive characteristic of this breed is its curly coat, and the general opinion is that the St. John's Newfoundland, the Irish Water Spaniel and the Old English Water Dog and the Poodle all lent something to the breed's origins. Curly Coated Retrievers can live up to 12 years of age, but with proper care and correct diet will live to 14 years. The female is usually 64cm tall and weighs 32kg while the male is normally 69cm tall and weighs 36kg. The Curlies usefulness as a sporting dog comes from a combination of pace, endurance, intelligence and a good nose. With its size and strength they are able to retrieve almost anything, but it is in the water that they excel usually showing a strong desire to swim from an early age. They also have an excellent ability to ‘memorise’ the fall of the bird and so it is not often that they will lose any fallen game. 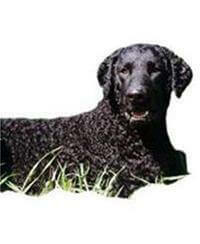 The Curly Coated Retriever is a slow maturing dog and may take up to three years to reach maturity. Their temperament is kind and good-hearted. They are not apt to bark, but when they do their deep bark alone is enough to stop unwanted intruders in their tracks. The Curly does have a mind of its own and is obedient, but tend to be so in its own time. They are a fun loving, gentle companion for all members of the family. The Curly seems to adapt to most other pets, and has been known to happily share his home with cats and other dogs. As with all large dogs the Curly Coated Retriever needs plenty of exercise to keep it in good condition. The Curlies do not need much grooming and are a ‘wash and wear’ dog. On no account should a brush or comb be used. A 10-minute grooming session, using scissors and trimming any scraggly bits from around the tail and ears is all that is required, no more than two or three times a year. Curlies adapt well to most people and as long as it is treated well it will be a loyal and devoted friend to its owner.